These are amazing. The price is great. They made my closet super organized. The service was fast and secure. They make organizing great. The shipping was fast. Honey-Can-Do HNGT01188 2 Pack, Four Tier Skirt/Pant Hanger, Chrome/Black. 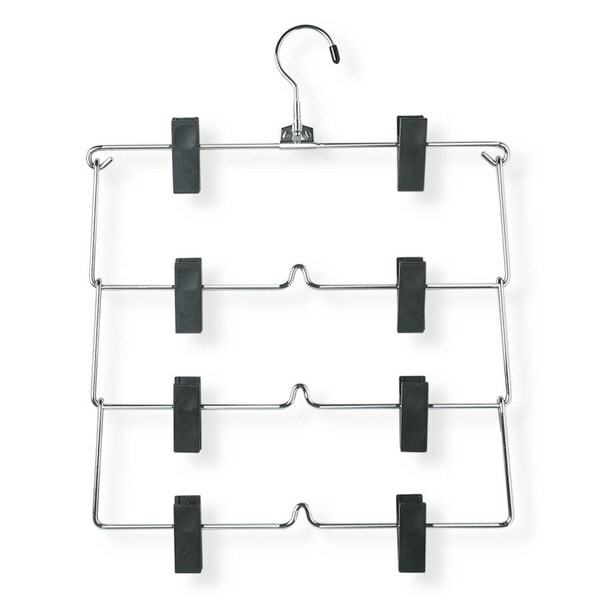 Quadruple the number of garments you can hang in the same amount of space with this 4-tier skirt/pant hanger. Foldable tier design incorporates a 360 degree swivel rod hook that fits any standard hanging bar. Strong, heavy clips are adjustable to accommodate a variety of sizes and styles. Durable metal construction and chrome finish provide long-lasting beauty and reliability. Love having skirts hanging neatly. A great addition to my closet. when your closet is a bit on the small size you need all the organizing helpers you can get your hands on. These fit that description perfectly. Quality is sturdy too...a must have! I purchased a couple of these. They are great quality and keep my skirts neat and organized. The also condensed them and gave me more room for additional clothing. IN THE SUMMER TIME I HANG MY SHORTS FOR EASY ACCESS.